Is your grout damaged and in desperate need of repair? Are you tired of looking at cracked, broken, or missing grout Groutsmith can make grout repairs at a fraction of the cost of replacing all of your grout. Unless you have experience in detailed grout repair, it is not a recommended DIY project. 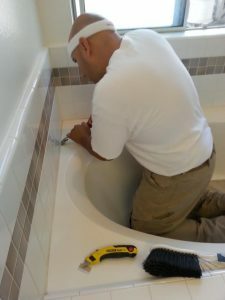 The skilled technicians at Groutsmith San Diego specialize in providing grout repair services. We will give your old grout a new look and transform the appearance of your grout so that it looks like new. Groutsmith will color match the repaired areas to match your existing grout. Before things get worse, you can call the pros at Groutsmith San Diego and have our skilled technicians come in and begin to repair your damaged grout. If you are interested in making your old grout look new again, contact Groutsmith for a free quote on grouting repair services.